Delicious home baked cakes made daily at Cherry Leaf. Cherry Leaf cakes are also available to order with 24 hours notice. 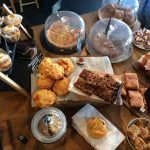 We make fantastic tasting gluten free and vegan cakes, and have a passion for making gluten free, dairy free and refined sugar free treats. Come and try them for yourself!